Freeway Series — Angels Sweep! I live in LA. I love LA. But I grew up in Orange County. And growing up in the OC means that I’m an Angels fan. So is my whole family. In 2002 when the Angels won the Series, our whole family — Aunts, Grandmas, girl friends, pets — we all wore Championship T-Shirts to Thanksgiving to take pictures for a family calendar. So today was the final game in the Freeway Series, and it’s pretty clear who’s playing the best baseball in SoCal. Sweep this series and took the preseason match-up 2-1. It was a fun game to attend. I went with my Dad and we sat way up high between 3rd and Home. There were a ton of trash talking Dodger fans in our section. Anywho, interesting developments since I went to a game last season. The Angels now sell commercials on the Jumbotron, not ust the lame contests that are sponsored, but actual commercials for DVDs, etc that took over the big screen and the PA.
And the were outages of Nacho Cheese and Hot Dogs at the concessions stands. WTF? Here’s more photos I took from the game here. 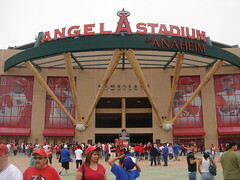 No matter what, I still refuse to call them the Los Angeles Angels of Anaheim. I hope it never catches on. At Dodger Stadium, you want to try a Dodger Dog, but you must be careful to get a grilled one, not a steamed one. The stands are marked differently, so you need to look carefully. @jozjozjoz: Yeah I don’t think many fans of the Angels like the new name either. I mean the city of Anaheim sued and most everyone I knew thee supported that suit at least in spirit (it was pretty clear they didn’t have an actual case). It was funny to me that the Dodger fans were heckling, “We’re the *real* LA,” at the game, some how implying that there was any support for the new name. It was just Arte Moreno doing what he does best, marketing. Getting attention. Sitting at the game I felt the first sort of cross town rivalry — I didn’t go to USC or UCLA. So this was my first taste. And it was fun. I hate the Angels, interleague play is dumb, and should only happen when you get to the World Series, IMHO.